Beautify your rooms with stunning floors without blowing your home improvement budget. Choosing luxury vinyl flooring! At our store, you will find countless varieties of luxury vinyl tile and plank products that are perfect for your home. As its name suggests, this flooring type offers luxurious features unlike other floor styles. Visit our showroom and speak with our staff for in-depth information about the features that set luxury vinyl apart from other products. The main highlights of luxury vinyl flooring are its extravagant beauty, resilience, and affordability. Thanks to its unique construction, luxury vinyl can mimic the appearance of ceramic, stone, wood, and any other material. With such a diverse array of colors, patterns, and shadings available, you are certain to find a product at our store that coordinates perfectly with your room’s décor. Lay down a beautiful foundation for your home’s interior design by choosing a luxury vinyl flooring product from our large selection. When you want a floor that is strong and easy to maintain, luxury vinyl is a great choice. It holds up well to scrapes, scuffs, and stains, making it perfect for high traffic areas and places prone to spills. Since vinyl is moisture resistant, it does particularly well in wet areas like kitchens, bathrooms, and laundry rooms. Luxury vinyl is even easy to clean. Routine sweeping and mopping is enough to keep it spotless on a day-to-day basis. If something spills on your luxury vinyl flooring, a diluted cleaner and light mopping is enough to lift the stain right off. Finally, homeowners across the nation love luxury vinyl because it is so affordable. With this flooring style, you achieve the same look as tile or hardwood at just a fraction of the price. This allows you to stretch your home improvement budget to other projects around the house—or just keep the money in your pocket. Either way, you will be pleased with how much you save when you shop for luxury vinyl tile or plank products at our store. We are part of one of the nation’s largest flooring retailers. This gives us the buying power to secure low prices on top brands, helping you get the best deal possible on your new flooring. Find all the assistance you need to achieve truly gorgeous flooring by visiting our showroom. Our staff is comprised of flooring and design experts who lend you their industry knowledge. We even handle the luxury vinyl tile installation for you. With our professionalism and expertise, you can rest assured that you are getting a floor that elevates your home’s appearance and value. When you come in to browse our showroom’s selection, our team members are always on-hand to tell you more about the products and make recommendations. We listen carefully to your design goals and budget limitations in order to help you choose the best floor for your needs. Once you have picked out your new floor, it is time for installation. Fortunately, you do not need to go through the trouble of finding an installer—or worse, doing it yourself. Our luxury vinyl tile installation contractors are trained to quickly and correctly install every flooring product we sell—including our many varieties of vinyl. Let us handle the hard work for you so you can enjoy your brand new floor as soon as possible. Few flooring products are as versatile as luxury vinyl. All of the different styles we sell are luxurious in everything but price. With our low prices, you can afford to indulge yourself and get your dream flooring. The following are just a few of the various types of luxury vinyl flooring products you will find on sale in our showroom. Do you love the warm, natural beauty of hardwood floors, but balk at their price tag? Vinyl planks are the perfect solution for you. Vinyl can mimic the appearance of any wood species, stain, or finish. In addition, it is a tough flooring product that can withstand years of heavy foot traffic. This is because it is constructed with a protective layer that safeguards your flooring from daily wear and tear. Homeowners favor ceramic because they love its classic look. However, the price of ceramic is not right for everybody. 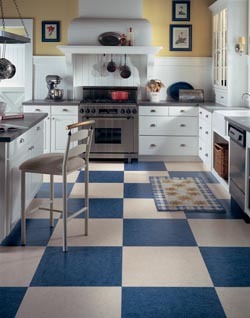 Fortunately, we carry several styles of luxury vinyl tile that imitate the look of different kinds of ceramic flooring. Unlike ceramic, our vinyl flooring is very soft, making it more comfortable to walk on. This also makes it safer for households with children just learning how to walk or other people who are prone to falling. The cushiony feel is due to the felt or fiberglass layered inside the vinyl, adding softness to the floor and spring to your step. Give your home the same distinguished character that stone floors offer by choosing luxury vinyl tile. There are countless vinyl products that have the same elegant look as stone without the same high price. In addition, vinyl is easy to maintain. Simply wipe up spills as they occur and occasionally mop your floor to keep it looking as good as the day it was installed. Contact our store for further information on our luxury vinyl tile and plank products. We're proud to serve customers throughout Tampa, Brandon, Carrollwood, New Tampa, and Lutz, Florida, as well as the surrounding areas.